Flying across the country can be expensive, especially when you are taking the whole family. But after getting invited by my relatives up north in New York to celebrate Christmas with them we had to make the trek. I guess this just means I will have to invite them next year before they invite me… clever relatives. Anyway, instead of flying we decided we would rent a car a save some money. In fact we saved a lot of money. You see our reliable Rental Car Momma had some great deals on mini-vans. We got a 10% discount on our weekly rental. If you do the math that turns out to be a lot, plus Ill have a vehicle if I unexpectedly have to get away from the mother in law for awhile a few hours. Especially since the price of the car wasn’t that much to start with. So we are taking our shiny Toyota Sienna up north tomorrow where we will battle the snow and visit my wife’s side of the family. 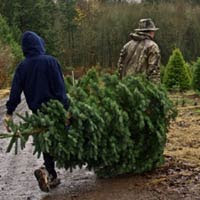 The best part is up north you can actually go out and cut down your own Christmas tree. It’s going to be an exciting adventure, and I am totally ready for my holiday vacation. Wish us luck, and there might even an update on our adventures… stay tuned!